IMPORTANT NOTICE: We will only give feedback to written requests which contain a full and proper name and surname and full contact details. Enquiries should contain exact information as to the number and ages of the adults, children and infants in order to make a proper assessment and price offer. 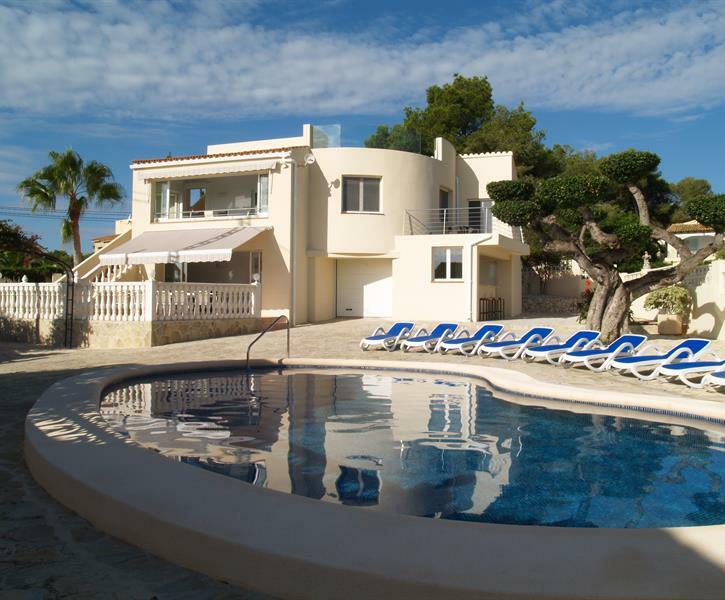 This villa will not be rented to groups of youngsters and is only rentable for tourist purposes. Each price offer in response to a formal price request will include the general terms and conditions in attachment. A confirmation of your booking implies acceptance of these general terms and conditions. Vi var två familjer bestående av fyra vuxna och fem barn i åldrarna 8-12 år. Villan är mycket väl utrustad och är perfekt för två familjer då den är uppdelad i två lägenheter, vilket gör att man kan semestra tiillsammans men ändå ha sin egen del. Huset och poolen var mycket fräscha. Det tog mindre än 10 minuter att gå tillnärmaste strand som är en fin stenstrand med flera restauranger i anslutning till stranden. Fantastiskt fint semesterhus i den underbara byn Moraira. Renoverat till hög standard av ägaren själv under2015. AC i alla sovrum, massor med uteplatser, både under tak och i det fria. Härlig pool för avsvalkande bad, fina solsängar vid poolen. Nära till allt, matbutiker, barer, restauranger, fina stränder. Perfekt för två familjer. An ideal location and lovely views from the villa. Supermarket and restaurants within a 5 minute walk. Small beach and bars/restaurants a 15 minute stroll away. Main beach and town a 30 minute stroll with beautiful views of the coastline. The villa was very clean and spacious and perfect for our family of nine. It was very well appointed. We would definitely not hesitate in returning. Joanna, the contact, was very approachable and helpful. It was a nice touch having the pool floats/toys which the children enjoyed using. We did use the local taxi’s to return to the villa from the main beach and town as the walk is uphill. A clean, well equipped villa in a perfect location a short walking distance to amenities. I would recommend this villa to any large family and the ground floor self contained flat is ideal for those wanting some independence.